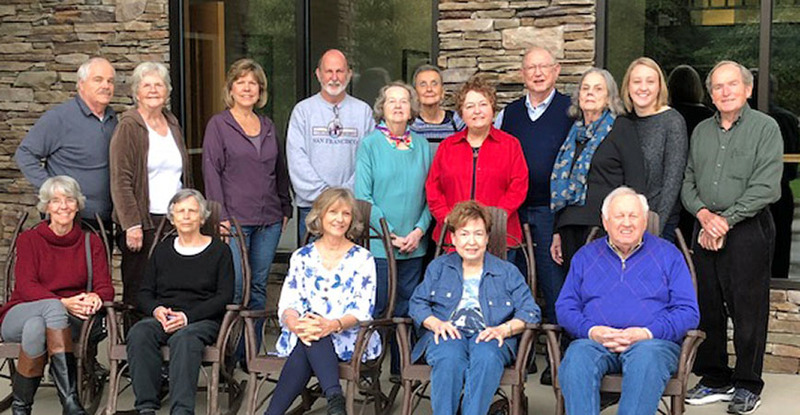 On Sunday and Monday of this week, I had the great privilege of spending almost 24 hours with Highland’s beloved Senior Adults on retreat at Wooded Glen. As their staff liaison, crashing their party is always a highlight of my year! Led by the dynamic team of Bob and Libby Cunningham, we were invited together to reflect and think about how our image of God, prayer and ourselves has shifted from our childhood until today. As we reflected on childhood, I heard several murmurs wondering if they could reflect back that far and expressions naming that that was so very long ago! And then, the stories poured out. Stories of God as a superhero with a cape, stories of God as all-knowing and all-seeing yet with an element of fear that was more than respect, stories of God as scorekeeper, stories of God as being love and limitless, stories of God as far away and transcendent. And then we reflected on the present, and how our images of God have changed over time and what caused that change. Does the living out of our lives shape our images of God, or do our images of God shape our life? Over and over again, I listened to wise persons with monumental amounts of life experience share how the experiences of life, particularly encounters with crisis or death or anything that significantly bumped up against images of our childhood God that just didn’t compute, reshaped their understanding and picture of God through a process of reflection, prayer, wrestling, questioning, and being willing to sit with God in the messy uncertain place. In a training for one of the curriculums we use for children here at Highland, Godly Play, I once a heard a story called the Theology of Childhood. In it, the storyteller shared about children and their encounters of God. How we first encounter the “Church God,” the God that we learn about and study and create our first concrete images of in our youngest years. But the God we come to know in time as we have the capacity to think abstractly and hope to know more deeply as we move through our days is the “God of power”—the God who is more than, bigger than, Other and mystery unexplained. As I’ve returned home, this distinction seems important—for the God of our childhood is incredibly important and grounding even, and yet so also is the growing and shifting and changing and morphing and wrestling with God as we experience life. What a gift it is to know that God welcomes this formation and transformation and calls us to a life of continual growth and discovery no matter our age or stage in life. And thanks be to God for the wisdom of the elders in our community of faith who have faithfully done and continue to do this growth work and can encourage the rest of us as we do our own. As we move through these days, may we each have the courage to take root in this way, that we might know God’s self in all of God’s fullness and love and grace and mystery.